Kydex material has been around since 1965, originally developed for aircraft interiors. In the early 1970s, FBI agent Bill Rogers was tired of stretching and deforming leather holsters, and made his own from Kydex. Kydex doesn't absorb moisture or oil like leather, has a lower coefficient of friction for a smoother and faster draw, and is also easier on the external finish of your gun than leather or other hard polymers. Kydex is great for your handgun, it can be precision molded for a perfect fit, offering superior, positive retention of your piece, it isn't so great for comfort against the body. That's where horsehide comes in, which is comfortable against the body and the saddle-soaped premium horsehide used by ProTEQ has markedly less moisture transfer than inferior cowhide. ProTEQ Custom Gear has been around for six years by now. Stephen Brannan, after years in the industry, saw the opening for better products in the self-defense market and started ProTEQ. The holster I've been testing is the ProTEQ Micro Kybrid for my Sig P365. It is a “serious” holster, meaning it is designed for use everyday, all day, and designed to hold up for years with constant use. The ProTEQ Kybrid holster has Kydex on both sides of the gun. ProTEQ also makes their lines of holsters in the “Hybrid” style, meaning Kydex 100 on the outside only with the rest of the holster being made from the same premium materials as the top of the line Kybrid. The reason for the Hybrid holster line is primarily cost: in Hybrid, the holster is $79.95, while in Kybrid style, the holster is $129.95. The more economical Hybrid is minimally thinner, and I do mean minimally thinner as it lacks the .062 inch inner Kydex shell. If you carry regularly, the ProTEQ Kybrid is the holster to get. It does everything a good holster is supposed to do: it gives you superb, dance-floor back-flipping level retention of your pistol, it protects your pistol without turning it into a rust-bucket, and it gives you the same, consistently smooth draw every time. Lots of things work, if only for intermittent use, but if you carry every day (the days when you would like the ability to defend yourself) the ProTEQ Kybrid is the way to go and helps protect you and your firearm investment equally well. 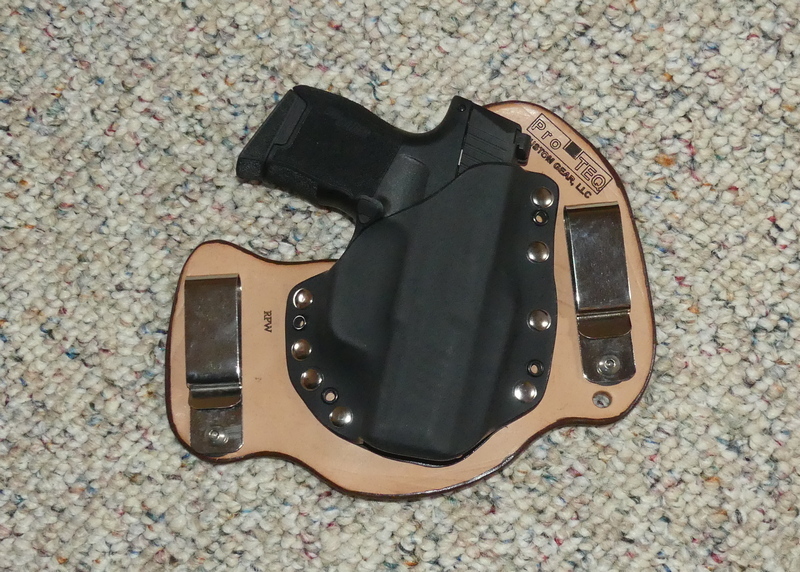 This ProTEQ inside the waistband Kybrid Micro is the best made, best functioning holster I've ever used. You can order yours today from https://proteqcustomgear.com/ in the style you prefer today and you'll be glad you did from day one.